In 1876 Alexandar Graham Bell won the first patent for the telephone, thus, paving the way for human beings to quickly and effectively communicate with one another remotely. I don’t know about you, but I’d love to have been a fly on the wall as some of those first conversations took place. I wonder if most people took the time to ask thoughtful questions of one another or if they spent their time regurgitating menial events of the day, such as how a bitter cup of coffee ruined their morning or how the neighbor’s laundry blew off of the clothesline for the third time in a week. Today, thanks to the onslaught of social media tools, we don’t need the telephone to talk about our ruined mornings and gossip about the neighbors. We can share any opinion we’d like using text, Twitter, Skype, Voxer, Ichat, Pling, or Bittygram (just to name a few). And if words aren’t your preferred method of communication, you can always snapchat, instagram, pinterest, and flickr to your heart’s desire. Suffice it to say, if you have a message you have a mode for sharing. Whether in the past or present, humans have always found some way to communicate with one another. Some of the first known attempts at communicating included the use of symbols in cave paintings and petroglyphs. Eventually humans turned symbols into writing systems giving birth to the alphabet and the creation of words. As exciting as this was, the written word was only accessible regionally until sometime around 310 B.C. when the Greek philosopher Theophrastus began placing messages into bottles and tossing them out to sea. While the idea of placing notes in bottles may seem romantic, Theophrastus had a very different idea when he wrote his notes. He wasn’t at all interested in finding his long lost lover or even requesting help in the form of an SOS. Rather, he put the sealed bottles into the sea to learn more about ocean currents. His primary purpose was to prove that the Mediterranean was formed by the inflowing Atlantic. Although his intention seemed scientific in nature, his action planted the seed for something more humanistic altogether-inspiring people to communicate on a global scale. If being social does make us more successful, that would account for the myriad methods we have created for connecting with one another. This is simultaneously exciting and frightening because words not only forge a bridge for transmitting information, they ignite something much more powerful; words spark energy. You likely remember the ubiquitous rhyme heard on playgrounds, “Sticks and stones may break my bones but names can never hurt me!” Unfortunately we have proven that to be untrue. In fact, insults and negative words not only hurt, they can leave lifelong internal wounds that never heal. Moreover, they can dictate how one reacts to future criticism, failure and everyday challenges in life. Many eating disorders, addictions, and self-detrimental habits are manifestations of messages that people have not been able to release from their systems. Some will scoff at the notion that words do anything more than simply dissolve into thin air, but the truth is that words have the power to leave emotional imprints that alter our biological design. Words symbolize experiences and, when internalized, become encoded into our biological systems and contribute to the formation of cell tissue. According to Carolyn Myss in her book, “Anatomy of the Spirit”, this is the reason many diseases and illnesses are related to unresolved emotional issues. There is a reason we have the saying, “The pen is mightier than the sword”. Words can lift us up or bring us down. Rarely is a war started through acts of physical violence. Usually the fires of war are sparked by the words, gossip, or miscommunication that leads to physical violence and thus fighting. Alternately, words can bring about treaties of peace and inspire speeches that rally and unite people for the betterment of a cause. Option A) John, remember the rule is to stay in the line when we walk in the hallway. If you choose to get out of line again, you will have a consequence. But, I know you have the power to make the right choice. Option B) John, what is wrong with you? Why can’t you remember to stay in line like everyone else? Get back into line! Interestingly, the message the teacher aims to relay is the same in both options, yet, option A yields a positive emotional imprint leaving the student open to learning. Option B, on the other hand, imprints shame and fear that will likely cause him to focus on the negative emotion rather than the message. Everyone has been given the power to hurt or heal and one of the quickest and easiest ways to do either is through our messages to one another. We can do this externally through our words and we also have internal messages that come across just as powerfully. Every time you interact with someone you carry your unique energy into the interaction. Whether you speak it or not, people can feel the energy you bring. For example, if you come into a meeting after having just had an argument with your spouse, you are likely bringing a message of anger, frustration, or anxiety into the room without saying a word. Think about a time when you’ve been around someone who is normally bubbly but just seems “off”. They are likely bringing a message of internal energy that isn’t radiating with yours. It could be your energy or it could be theirs; Either way, you are sending messages to one another that could be negatively or positively impacting the exchange. The good news is that you can choose the type of energy you bring into any interaction by simply re-writing your internal message. Take the example of arguing with your spouse. While you can’t go back and change the argument, you can take a moment to step outside of your frustration to refocus on something you are grateful for and allow that to be the internal message you subliminally share. The message you share is important in how you relate to strangers as well. Have you ever attracted someone into your life who drains you of your energy? Do you seem to attract the same qualities in mates over and over? The message you share will attract exactly what it is meant to attract. For example, if you are carrying a message that reads, “ I am insecure and do not value myself”, you might attract others with the same message or, worse, someone who might want to take advantage of you. If you want to attract love and happiness into your life, you simply have to put that message within so that it will radiate without. Whether through words or internal messages, we are constantly communicating a message of either love and light or fear and dark. We may not all live by the ocean but the metaphoric currents of social media combined with daily face-to-face interactions provide us with a channel. The responsibility, power, and choice of energy serve as the pen and paper. 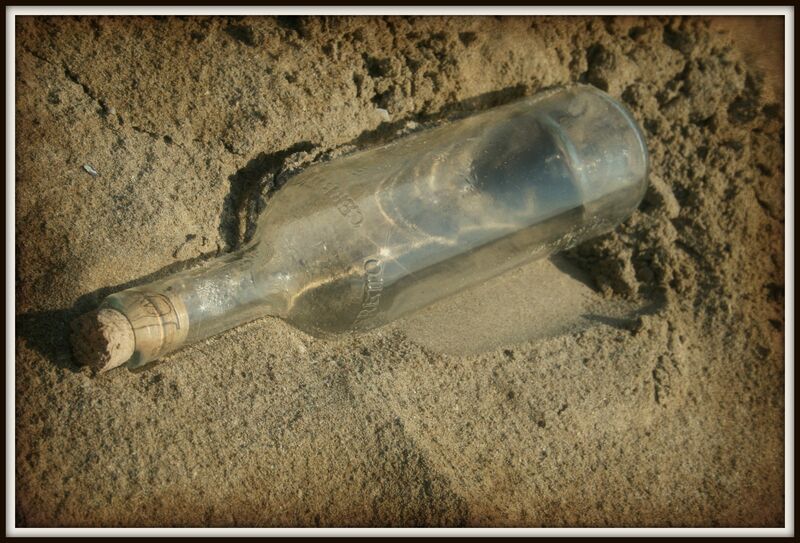 So, what’s your message in a bottle? Find an empty glass jar or bottle and put pieces of paper and a pen next to it. Each morning when you wake up, write down an intention for the day. The intention can be anything that will fill you with positive energy and should reflect the message you want to send to others. Essentially, you are writing down your message in a bottle to the world. Place this message inside the bottle and, before you go to bed, pull it out and reflect upon the day and how living your message impacted your actions and the actions of those around you. You might also choose to do this for a loved one, such as a spouse or child. Each night, write something special and put it into the jar so that when s/he wakes up in the morning s/he can start the day with a positive message. I am grateful for _____! I am an example of love! I am stronger than the challenges of this day! What is my message in a bottle? What type of energy do I radiate to others? I am love and light and communicate positively with others. My grateful heart adores you. With you all is possible. Open my ears, my eyes, and my heart to your Divinity. And fill my words with your light and love.